Brittany, a 3rd year physical therapy student from Virginia, knew she wanted to travel and volunteer in her field to fulfill her university’s service requirement. Plus she wanted to go with a group of fellow physical therapy classmates. Enter ELI Abroad, with its volunteer and internship opportunities in more than 26 nations around the world. 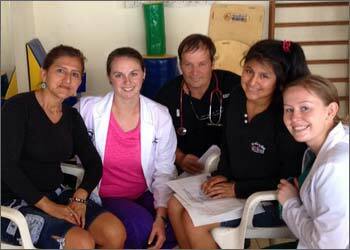 Her group of 2 clinicians and 1st, 2nd and 3rd year physical therapy students -- a total of 8 volunteers -- began their adventure in Quito, where they met ELI’s in-country coordinators and stayed at a small hostel. They spent a day and a half in Quito, touring the city and exploring its historic center -- one of the largest and best-preserved in all of Latin America -- before heading to Puerto Lopez. This small seaside village, with a beach where you can snorkel and surf, was the group’s home for the next 9 days. They stayed at a small hostel and began their internship right away. There was plenty to do: the wife of Puerto Lopez mayor had arranged for many patients to come to the clinic while Brittany’s group was there. “On our first day we saw 80 patients!” Brittany exclaimed. It made for an overwhelming, but also exhilarating introduction. The volunteers split up into small groups and, partnering with the clinic’s only other therapist, an occupational therapist, began evaluating patients, assigning therapy and exercises, and offering hands-on help. “We dealt with all kinds of issues - from strokes to orthopedics,” Brittany says. The students brought a wheelchair with them from the U.S. and were delighted to donate it to Javier, a spinal cord injury patient who hadn’t had any physical therapy since his accident nine years before. “Javier was immobile before the wheelchair, but our group even got him to work on parallel bars,” she says, sounding -- quite rightly -- just a little proud. 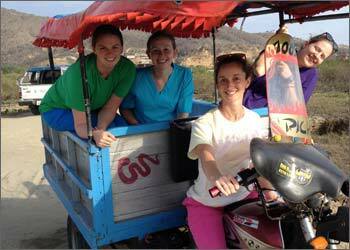 Her group continued seeing and working with dozens of patients each day. They were also able to work closely with the clinic’s occupational therapist: they taught her specific helpful exercises and even offered ideas to streamline some of the clinic’s processes. 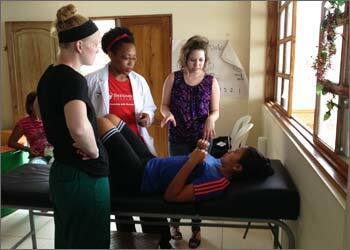 For the young physical therapists-in training, it was an invaluable professional experience. 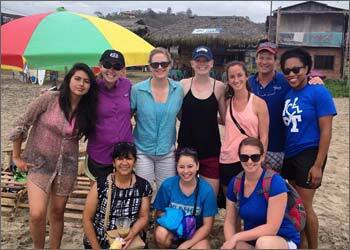 And the impact they made in Puerto Lopez was palpable. At the end of their stay, they left materials with explanations of exercises for future use at the clinic. The mayor’s wife was so impressed she threw them a going-away-dinner party as a way of saying thank you. “People would ask us, ‘When are you coming back?’” Brittany says. “I’d return tomorrow,if I could, and stay a lot longer!” she laughs. Looking back on her experience, Brittany shares insights for other prospective physical therapists in Puerto Lopez: bring some exercise equipment with you. The clinic does have some larger equipment but lacks such smaller items as dumbbells, exercise bands and items for balance training. She suggests you learn some medical Spanish; you’ll learn plenty more in Ecuador, but it’s good to know some basics to start with. “Charades work pretty well, too!” Brittany says. It’s something she and the other volunteers relied on when they didn’t have a translator on hand. 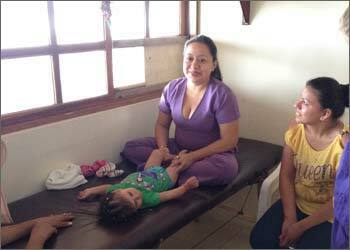 She also urges physical therapy aides and speech therapists to consider internships in Puerto Lopez. But most of all, she encourages all those wanting to volunteer -- alone or with a group -- to contact ELI Abroad.